Bring colorful elegance to mealtime with the Calypso fashion. 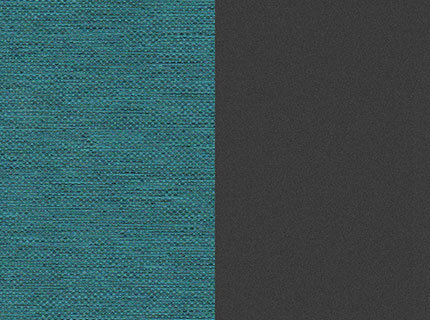 Featuring bright teal softly woven mélange, rich charcoal grey wipeable vinyl, and a shimmery silver zipper, Calypso is style you and baby simply can't refuse. Polly Progress 5-in-1 Highchair - Calypso is rated 4.4 out of 5 by 15. Rated 5 out of 5 by Sfree from Great features This chair is great! It is such a relief to have a product that can last with the baby as she grows. In the long run this chair saves a lot of money, and you do not have to worry about going out and buying more products to keep up with each stage. We have a smaller home so this chair works great since it can easily be put away for storage. The wheels make for easy maneuvering so I can go from the kitchen to the living room when needed. The adjustable height helps as well since we do not always stay in the kitchen, and I can adjust the chair to me whether I am sitting or standing. I love the fabric on the seat. It also comes off easily for washing, making for a quick clean up. Rated 4 out of 5 by Lgibbons from Great adaptability I was sent this product by Chicco in exchange for my honest opinion of the product. My husband and I love the fact that it is able to grow with our child from a new born to toddler. Also it was super easy to assemble and store away when not in use. The only reason I didn’t give it 5 stars was because it seems a little bouncy when in the laid back new born position, but is still a very strong product. Over all this is a great product and would highly recommend it to anyone who is in the market for a high chair. Rated 5 out of 5 by KKB85 from Brilliant Design! Cannot say enough good things about this chair. The fact that I can use this chair as my child gets older is amazing! The set-up was minimal and easy to understand. The steps to transition the chair to all five settings is also very easy. The fabric is beautiful. The chair is durable. Revolutionary design! Love it! Chicco provided this product to me in exchange for my honest opinion. Rated 5 out of 5 by BusyMom6 from Love the versatility! I have 5 kids ages 13 down to 3 and have had a fair bit of experience with baby gear. We didn’t think we’d need a high chair again, but recently became guardians of a four-month-old and were very thankful to receive this product from Chicco in exchange for an honest review. What I love: The tray is easy to adjust one handed, as is the recline feature. Height adjust is also convenient and easy to use. The fact that this high chair switches to a portable booster is nice since it prevents a second purchase down the road. Additionally, since you can use the booster and then the high chair base as the youth stool simultaneously, you have an extra seat when having friends over. I love having a removable tray so washing between meals is much easier. I agree with other reviewers that I wish all 4 wheels swiveled as my last Chicco high chair did, but it does glide nicely and the wheel lock works well. We are looking forward to years of family meals with the Polly Progress around the table with us helping the baby to be safely and comfortably included! Rated 5 out of 5 by ABozz37 from compact and efficient I love that this is so compact. We have a tiny home and leaving the high chair out all the time is definitely in the way. Very easy to fold and store. We also enjoy that the seat reclines for newborn feedings... so we can all eat at the same time and not have a baby in someone's lap. Rated 5 out of 5 by Mama43218 from Perfect for growing children! I recently received this highchair and absolutely love it! The features and fabrics are so nice and I love that the highchair will continue to grow with my children. As a parent of multiple kids, I look for things that will last and this chair is definitely one of them. The convenience of letting my baby sit at the table with the bigger kids and easily transitioning the seat to fit one of my older kids when my infant is napping makes this one chair multi-use within my own family. I couldn't be happier with this purchase. Rated 1 out of 5 by Casseylynn from Over priced and over complicated We paid a lot more for this chair than what is listed on the site. Day 1 the hinge on the headrest broke. The design is too clunky and impossible to clean. I would never buy this again. Go with something simple abd inexpensive. The Polly Progress high chair has a space-saving fold to stow away conveniently for compact storage. I have my 6 month old in the infant mode and I cannot get the shoulder straps tight on her. I have them pulled all the way tight. Since this can be used for a newborn I figured the straps could be tightened. Could you explain how to tighten appropriately? Can I purchase a new seat cover? Replacement parts for the Polly Progres5 high chair are available on our website or by contacting our customer service department by phone at 1-877-424-4226. Polly Progress 5-in-1 Highchair Is it suitable for newborn babies 0M+? The Progres5 high chair may be used in Newborn Recliner mode from 0-6 months of age. The Polly Progres5 high chair does not include a toy bar. The toy bar is only included in the Polly Progres5 Relax high chair. Dear Chicco I want to ask: Product Weight of&nbsp;Chicco Polly Progress 5-in-1 Multichair - Naturale: 25 lbs Shipping Weight of&nbsp;Chicco Polly Progress 5-in-1 Multichair - Naturale: ? Is the seat cushion machine washable? &nbsp;Can it go in the drier? &nbsp;Is the tray dishwasher safe? &nbsp;Also what are the weight maximums for each stage?